Attempt to umpire baseball and you'll quickly realize nobody can single handedly ruin a baseball game quicker than a lousy umpire. (1) Got a wild pitcher, .... change to another pitcher. (2) Got a First baseman who can’t catch the ball today, change to another player who can catch. (3) Got an Umpire, who has an attitude and can’t properly perform the job... Pray for rain. 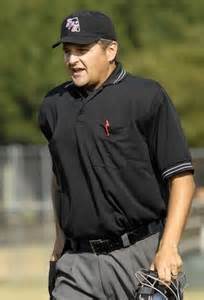 Take note, whether little league or professional,the umpires are the only participants on the baseball diamond who hopes nobody remembers seeing them, as that’s a sure sign they performed his job well. Let's exam the methods to become a good umpire. Everyone knows the players are in a physically demanding situation, but have you considered the ump receives no rest period, as the teams do while batting, and he is also required to stand and endure the elements, Summer's 100+ degree temperatures or early season cold. 3. 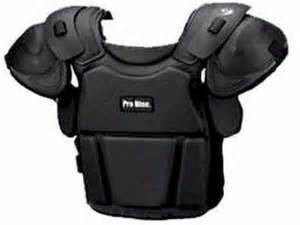 Face Mask ... Umps do not wear protective head gear such as the Hockey style mask worn by some catchers. (b.) Pocket to hold extra strike, ball, out clicker…..
A. Blue or Black short sleeve shirt, White was historically worn and is acceptable at younger age groups, but not older because the white shirt could hinder fielders from picking the baseball up as it could blend with the shirt. B. Blue, Black or Grey pants … blue jeans or shorts are Not proper. C. Black shoes, either tennis shoes, spikes or protective steel toe umpire shoes. 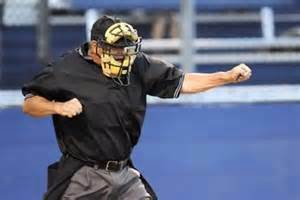 The Field Ump(s) are spared from wearing the hot protective equipment and are equipped with only the ball, strike, out clicker, which he should frequently compare to his partner’s to insure they have the same data. An ump must utilize a Structured Pre-game Procedure. *** The following is Just an example of as the specifics of these instructions may not apply to your particular situation, as Youth League Association rules & procedures vary, but it is a good example of the normal duties of a little league umpire. (a.) Ball goes under or sticks in the outfield fence … an automatic double. Have your fielder raise his hands to indicate the ball is stuck. (b.) Right field has no barrier for foul territory out of play, a ball hit within an imaginary line extended from the end of the dugout to the parking sign is “in bounds” …past it is out of bounds. This will be the umpire’s call. A player must slide into home if there’s a play. It’s important to note issues such as this in ground rules, because not all associations may enforce the rule. Answer any questions in a professional and courteous manner, remembering this is your chance for giving the coaches their First Impression of you and / or your crew and could set the tone for the entire game. The Home Plate Ump should always announce the “Start” time of the game, not only as a professional courtesy, but for leagues which play games under a time limit restriction, it could mean the difference between a team winning or losing depending on whether they can start another inning before the time limit expires. ******All time limited games essentially stop another inning from beginning after the designated time, it doesn’t stop all play when the time expires, and some leagues allow tied games to continue until a winner is declared. 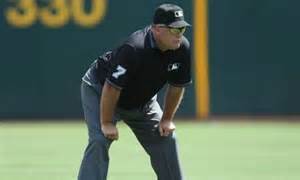 The Home Plate ump is traditionally the Chief umpire and his watch is the official time, although it’s an excellent idea to synchronize watches with the Field umpire(s) in the event the plate umpire’s watch malfunctions. After completion of the play and while the ball is dead … loudly announce the Starting Time to each dugout. Being a Great Ump can usually be accomplished by adhering to 3 issues, which will offer the greatest opportunity for the game to go as smoothly as possible and making the umpiring crew a ghost, which is the intent. NUMBER ONE.... and I can not stress this First Issue enough ... Be Consistent With The Strike Zone! I’ll repeat that... Be Consistent With The Strike Zone! The Strike Zone described in the rule book may have at one time been strictly adhered to, but not today as everybody, including umpires, has their individual interpretation of what a strike and ball is. (a.) I’ve found umps who were former pitchers will favor a low strike zone, because that’s how they were taught to pitch, and probably teach their players to throw. (b.) I’ve also found umps who either did not play or played limited baseball, will favor a larger strike zone similar to what the rule book describes a strike to be. Again, it doesn’t matter, per se’, what you classify a strike, as long as it remains a strike from the first to the last pitch and is called equally on both teams, you’re doing a good job. The Second Issue is to be Loud when calling the plate. You must keep in mind, especially at older aged or higher skilled levels of play, the Ball/Strike count greatly affects where defensive players play and/or the type of pitch to be thrown. I strongly suggest you only call Strikes and silence means the pitch was a ball. You don’t have to call every pitch what it is. Ball ..outside Strike … inside corner etc. etc. You’ll be hoarse by the 3rd inning. Therefore, if the coach and fans hear a loud bellow, whether Strike or Strikeee, etc, there will be no miscommunication of whether it was a ball or a strike. Also always indicate a strike with some movement of the right arm, up, out, cocked, doesn’t matter, just some movement. (A.) Although not a required rule, it's good practice and I suggest announcing the count from time to time, with accompanying fingers, strikes on right hand - balls on left. Third Basic Rule is an umpire can not be thin skinned or have elephant ears. Baseball is a competitive sport where emotions run high and you’re going to hear some oohs and ahhs. Ignore them. It’s part of the game. 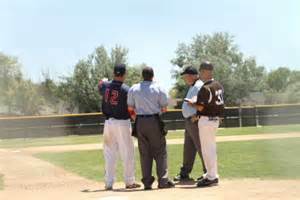 Most baseball associations utilize a two umpire system, except for possibly the youngest leagues, where a single umpire may be used, or a championship game where 4 or more umps will be used. It is essential the umpires, whether 2 or 8, communicate with one another, discussing individual responsibilities in certain situations prior to the game. For instance, who and how will foul balls be called? Normal procedure is the Home Plate Umpire will make the call, fair or foul, before the baseball reaches the base, the field umpire makes the call after it passes the base, first or third. However, if you’re playing on a grass infield which has cutouts at the corners, you agree to change it to the cut outs instead of the base. Believe me, a play where you have conflicting Fair and Foul calls by the two umpires is an absolute nightmare which should not happen. When does an umpire get into position? From your relaxed position, which is in between pitches, you should assume the position you’re going to be making your calls from the moment the pitcher toes the rubber. The rules state a pitcher must be in contact with the pitching rubber to take signs from the catcher. So it doesn’t matter whether the pitcher is operating off the stretch or a full wind up, toeing the rubber is his initial step to begin pitching. "Umpire Baseball" - Why so early you may Ask? Why not wait until after the catcher’s signals? To be an excellent umpire you must maintain the best line of sight of the baseball from the pitcher’s hand to the catcher’s mitt. Your head must be still in order to do this. If you wait until the pitcher begins his move towards the plate your head would be moving as the pitch approaches. This is unacceptable. Your head must stay still. Another communication example is with runners on base, the field umpire will position himself behind the pitching mound, halfway between the mound to second base, and will make all calls on the bases. Obviously when this situation occurs, the home plate umpire will make all foul ball calls. Tricks of the Trade: With no runners on base the Field umpire(s) should position himself straddling the base foul line @ 10 - 15 feet behind first or third base. Why straddle the line? You’re responsible for calling fly balls down the line, fair or foul and by straddling the foul line there’s no taking your eyes off the ball searching for the foul line then trying to pick the ball back up. Some things you'll learn here will not be what's taught at umpiring schools, but umpiring schools are based on a 4 person umpiring crew, I on the other hand cater more to the standard 2 man system of little league. Being 30 feet away but looking straight at the play unobstructed is much better. If a play is close, such as steal attempt, a coach will accept a call against him if he feels the umpire saw it that way, but if he feels the umpire was blocked out and is guessing at the call, he’ll feel cheated. Another tip for seeing the play is to always try to get into position where your chest is facing the play. If your chest is toward the play your head and eyes are automatically faced toward the play giving you the best possible view of the play. Anticipation by a player is important and to the umpire, especially the field ump, who should never get caught flat footed on a steal attempt, because he had already anticipated the possibly of a steal. However, the ump must resist the temptation to anticipate the safe/out call. For example, anticipating a steal of third base, you are in perfect position to see the play. 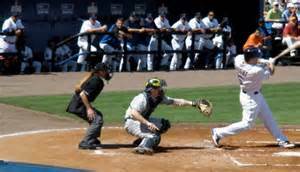 The Catcher's throw has the ball there 5 feet before the runner arrives, you are preset to call the runner out. But, what if, after you've prematurally called the runner out, the fielder makes a swipe tag and the ball flings out of his glove? Never anticipate the call and it's a good practice to wait a split second before making the call. Signals, even in a small little league field is important, as a good coach will teach his fielders to look for an umpire’s call in certain situations and you, as a good umpire, want to fulfill your responsibilities. The base runner is unable to see what happened in the outfield, therefore he’s confused as to whether he should run back to the base and tag up because the ball was caught,risking being thrown out attempting to score by the outfielder who is now very close to the infield, or should he take off for home because the fielder trapped the ball. Like it or not, whatever happens on this play is by a large part, totally and initially dependent on the Umpire’s actions. Seeing how important these signals are let’s exam some hand signals. (1.) Ball … There is no hand signal for a ball. (2.) Strike Call … Each ump, after awhile, will develop his own unique hand signal for a called strike. Some raise their arm straight into the air, some ball their fist and extend their arm sideways like he’s punching something. Others will step backwards and bring their arm out then immediately back to indicate a strike. Just about any hand signal will suffice when indicating a called strike. Anytime there’s a Dead Ball situation play is automatically stopped and remember the ball must be put back into play before the game can continue. (4.) 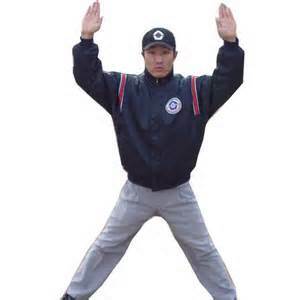 Time … Extend one or both arms forward with your palm out and call “Time.” Two things to remember as a Home Plate Ump when calling “Time.” If you grant the batter time out as the pitcher is starting his windup, turn away from the plate. If you didn’t see where the ball crossed the plate, you can’t make a call. There’s no sense in a coach arguing whether you gave Time Out too late, as it doesn’t matter because you can’t call what you did not see. (5.) Safe ... Simply extend both arms straight out away from your body, resembling an airplane. (6.) Infield Fly… The first important thing is for the umps to recognize an infield fly play is a possibility and to communicate that to each other prior to the pitch. The Plate and Field Umpire should signal one another indicating a thumb’s up sign, a pat on top of the head, doesn’t matter as long as both are aware of the situation. (a.) Should the ball fail to be caught, but lands fair, the batter is still declared out. (b.) Should the ball land foul it’s declared a foul ball.